Proofreading means different things to different kids. For some it may just mean adding punctuation at the end of their sentences and capital letters at the beginning. Others may spend most of their proofreading time getting their spelling right. And others will be checking for various types of simpler or more complex grammar points. 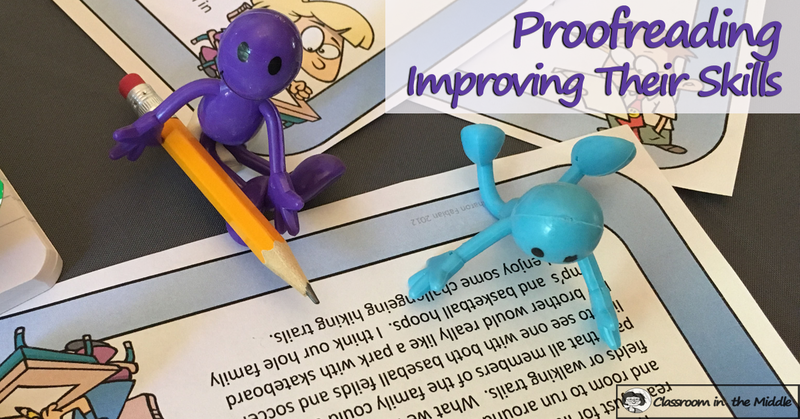 In the middle grades, kids already have some familiarity with checking their work to correct errors, so now the goal is first to check for more types of errors, and second to find more of them. 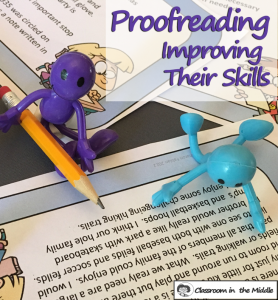 There are lots of ways that teachers go about teaching kids to improve their skills in this important step of the writing process. Of course it takes practice, and I like to start really small – with single sentences, and then work up to paragraphs and then longer essays. Another good idea is to start by proofreading for one type of error. Start by teaching or reviewing that one particular skill, have kids practice finding examples in sentences, and then move right on up to longer and longer passages. For example, remind the kids that not all sentences need to end with periods. Then have them check for sentences that could use a question mark or exclamation point instead. Or start by teaching kids about subject-verb agreement, and then have them locate the subjects and verbs in sentences and check for agreement. It’s a good idea to start with prepared samples that have the errors you want to work on built right in. After practicing on sentences and paragraphs of this type, students will be familiar with just what they are looking for and are ready to move on to something a little more complicated – “student essays.” Sample, or mentor, passages are a good intermediate step because you can pre-read them to check on the number and type of errors as well as the difficulty. Once kids have mastered this step they’re ready to move up to checking their own essays or the essays of classmates. Proofreading is a great activity for partner work, especially when students are at the point of checking their own and classmates’ essays. It can take a little while to get this step going since the kids need to learn how to “criticize” another student’s writing appropriately. Some kids don’t like to point out errors to their classmates and tend to let too many things slide. Others get too competitive and jump on every “mistake.” They’ll all need to be reminded that improvement is the goal, and that they are working together as a team to get a better grade for both partners. In some cases, having the kids point out correct examples in their partner’s writing can also be useful. 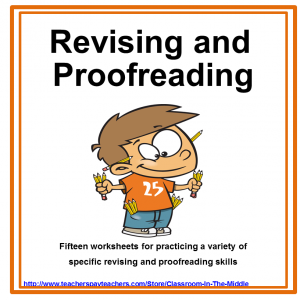 Learning to use proofreading marks to indicate the errors also helps the process to run more smoothly. 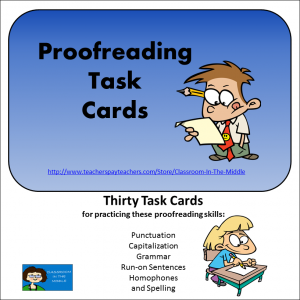 As far as resources for practicing proofreading, I have several now in the Writing Process and Prompts section of my store, but I think my favorite is the task cards pictured in the photo above. 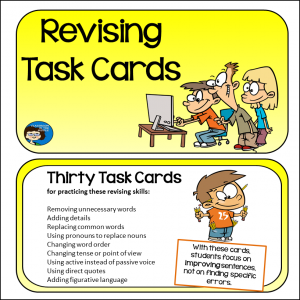 It is a set of 30 half-page cards that give students practice correcting specific types of errors. 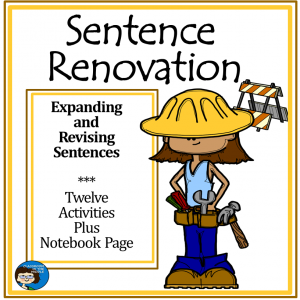 The topics include punctuation, capitalization, grammar, run-on sentences, homophones, and spelling. The content on each card is a good amount to give middle graders plenty to work on. Click on this image if you would like to see a preview.